Hop on your board and take part in five extreme skate events! 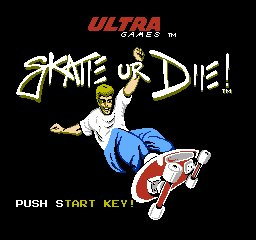 Long before the Tony Hawk’s franchise made skateboarding games mainstream the cool kids got their kicks on Skate or Die for the NES. 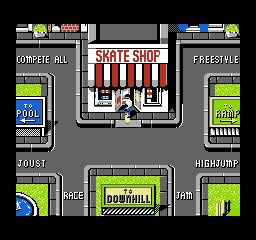 The action begins in Rodney Recloose’s skateboard shop. He’s a crazy middle-aged dude with a blue Mohawk who organises different event such as freestyle, high jump, downhill jam, downhill race and joust which you can compete in. 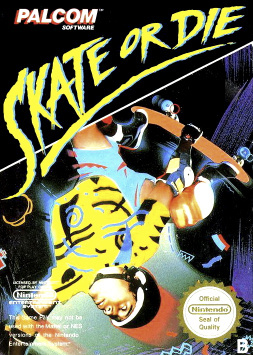 The freestyle event lets you show off your rad moves on the halfpipe, to gain more points you just need to hold a handstand on the end of the pipe or do some spins in the air. You get 10 attempts to show off your skills and build up points then its game over. Pulling the tricks off is harder than it looks, you’ll have to judge the right angles perfectly. High jump is pretty much the same idea but the aim is to get as high as possible. You need to frantically pound the action button to build up speed and get some cool air. Again landing straight with your board is very tricky; it’s all too easy to crashing back down to earth. This is probably the worst event. Downhill jam is a good laugh; you race against a punk called Lester who punches you to show you down along the way. You have to avoid such obstacles as puddles and walls. 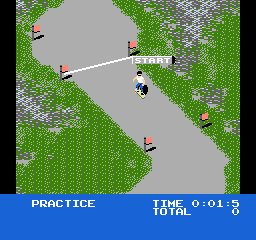 Your score will be determined by a combination of how many obstacles you can avoid and getting a good time for the course. To spice things up there are also ramps to do tricks from and of course you can punch Lester back if he starts to annoy you too much! In the Downhill race it’s much the same idea, but you ride solo. The goal is to finish as fast as possible but there are some horribly sharp turns to negotiate. Last but not least is Jousting, as you might expect you have to avoid the jouster when it’s their turn, and line it up perfectly to hit your opponent when it’s your turn. The first to get hit 3 times loses. To gain control of the joust you need to avoid getting hit 5 times. This is probably the most fun out of the events on offer. The graphics and sound aren’t much to write home about, but for a game of this age it is forgivable. What we find less forgivable is how clunky the controls feel and how repetitive the events are. There really isn’t enough variety on offer here, when compared to other multi-event sport sims such as California Games this game is left eating dust. Nostalgic fans from yesteryear might still get a kick out of this, but it is recommended that others give it a miss. It’s not terrible, but it’s far from being great too. i am surprised that america still hasn't got this yet. I don't understand, this game is not available on French VC ? Why ?? ?